Contemporary Cards Made With Vintage Printing Blocks. Welcome to Red Barn Letterpress! Contemporary greeting cards made with vintage printing blocks, since 2013! Check out my new Hudson Line cards in the menu above! Holiday and Greeting cards inspired by Hudson, Columbia County and the Upstate experience! Red Barn Letterpress is located (you guessed it!) inside a red barn at Claverack, New York. The town of Claverack sits near Hudson in beautiful Columbia County. 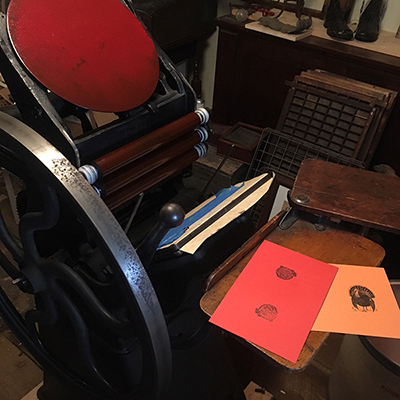 Each greeting card is printed by the owner, David Sokosh, on one of three vintage printing presses. Using printing blocks dating from 1900 - 1970, Sokosh creates contmporary cards, sometimes irreverent, often ironic and always heartfelt. They are priced at $5.00 each. Mix and match the designs and order as many as you like. Shipping in the US is a flat $7.00 for up to twenty cards. Each comes with a matching or contrasting envelope (as shown) and is protected by a clear sleeve. Red Barn Letterpress cards are available exclusively through this website and in person at events I attend throughout the year. Click Find Red Barn in the menu above for my schedule (If you are on your smart phone, look closely for the grey menu symbol in the header above. Hard to see but I promise it's there!). You can also view the cards and get more information in the menu above.